Cards: Score 2009, Upper Deck 2009, Press Pass 2009, Press Pass 2009SE, Donruss Rookies & Stars 2009, Upper Deck Star Rookies 2009, Playoff Prestige 2009, Pacific 2009. 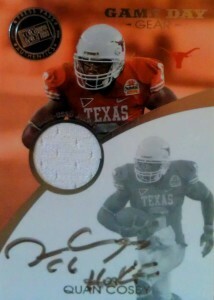 Acquired: 2/16/2013, Longhorn Neighborhood Foundation Bowling Tournament, GMC Texas NFL Tour 2013. 3/15/2014 Longhorn Neighborhood Foundation Bowling Tournament. 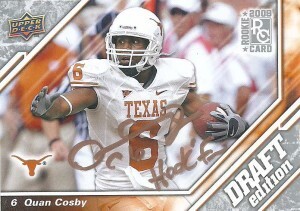 Quan Cosby had some great seasons for the Longhorns as one of Colt McCoy‘s go to targets at receiver. 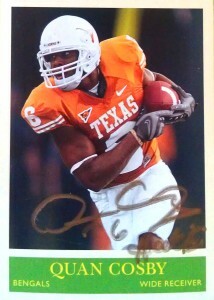 He also had a habit showing up when it counted, making the winning TD grab in the 2009 Fiesta Bowl. 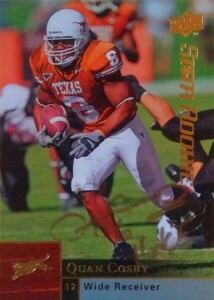 He finished his career at UT with 212 catches for 2,598 yards and 19 touchdowns. At 5’9″, 196 many teams felt he was a bit undersized and he went undrafted. 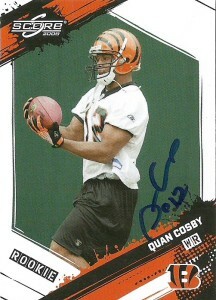 He quickly found a home with the Cincinnati Bengals. The Bengals offensive system was predicated around their superstars, Carson Palmer, Cedric Benson, and Chad OchoCinco. He was able to grab a roster spot as a return man for the franchise while he honed his receiving skills buried on the depth chart. Over two seasons he grabbed 6 receptions for 71 yards. Cosby was very valuable at punt returner. In his rookie season Quan had 40 punt returns, (2nd in team history at the time, since surpassed,) for 474 yards. Both numbers led the NFL. In 2010 Cosby had 30 punt returns for 225 yards, but the team had been building up the receiver depth chart with guys like former Longhorn teammate Jordan Shipley. Quan was simply caught in a numbers game and was made a free agent after the season. He split the 2011 season with 2 franchises: the Colts and the Broncos, where Denver put him back to work again as a punt returner. He signed with the Jaguars in 2012, where he was reunited with Shipley. 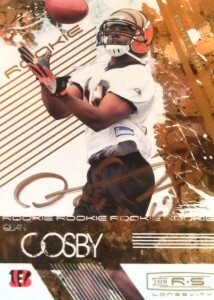 Again, Cosby was another player I got from the LNF Bowling tourney. I was very lucky to get him as he was walking out the door at the end of the day and he was kind enough to sign these two cards for me. Of note, Cosby is apparently a talented Baseball player, and spent a few years in the Angels farm system before joining the Longhorns in Austin. I decided on a whim to go a bit early and try to get him at the GMC Texas NFL tour that was going on in November of that year. 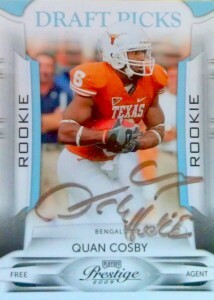 The prize of the day was VY but I thought a nice consolation would be another Quan card. Why not? With little or no line for Cosby’s early start time, this allowed for him to chat with each and every fan. He was very accommodating and took a photo with me. Much to my surprise he also asked me about my thermal, and asked me where I had gotten it, telling me that he, “Liked my style.” He also gave me this pretty nice autographed photo to boot. 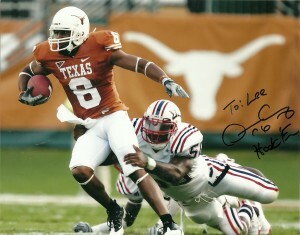 Cosby was also just penciled in by the Texas Longhorns to replace Rod Babers on their sideline reporting. Quan told me he had originally found out through Twitter because he had started receiving congratulations about the job. He said he was nervous because his interview was going to happen the day after the event we were currently at! I told him not to worry and that he’d do a great job. When I asked him how badly the Sooners were going to beat Texas, Quan said that he, “Had ultimate confidence in Case and that the Oklahoma team was young. We’d stand a good chance at winning.” I brushed it off as homerism, but you know what- he was right. 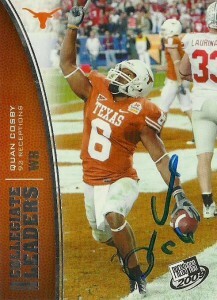 I look forward to seeing Quan at future events around town now that I have restocked on his cards. Overall, the GMC event was fairly well run. I did get the autograph of every player that attended that I wanted and to boot, the quality of the photographs were outstanding and on good Kodak photo paper. I went to the 2014 Longhorn Bowling Tournament, hoping to – well… sneak in, utilizing one of my contacts from the 2013 event, but unfortunately he wasn’t there, so I felt my time there was inappropriately spent. On the way out I decided to spam Quan with a bunch of cards. After patiently waiting for him, he signed all my cards, and told me he hadn’t seen many of them before. 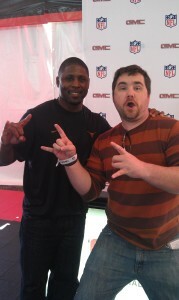 He also broadly smiled when I told him he was right about the Longhorns beating Oklahoma.